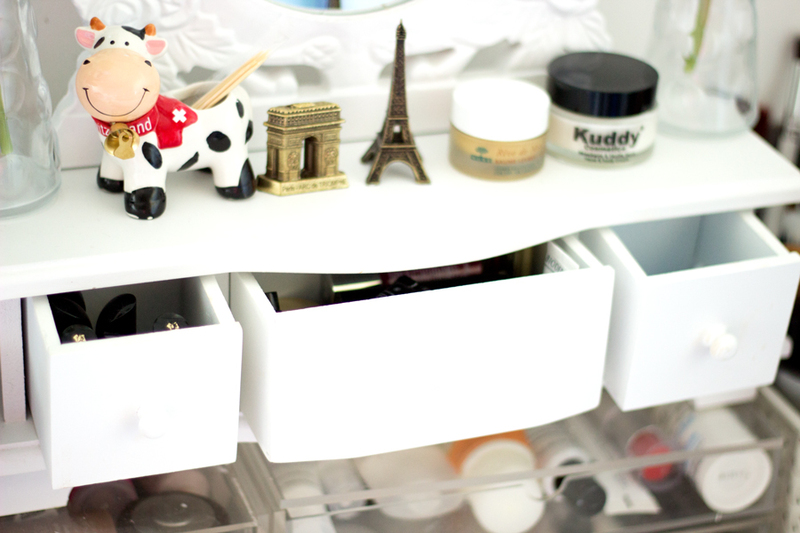 One of my favourite posts to read is any post about makeup/beauty storage and vanity. I scour Pinterest every now and then, so I can just lust after pretty vanity/beauty tables and trust me, there are so many to lust after. 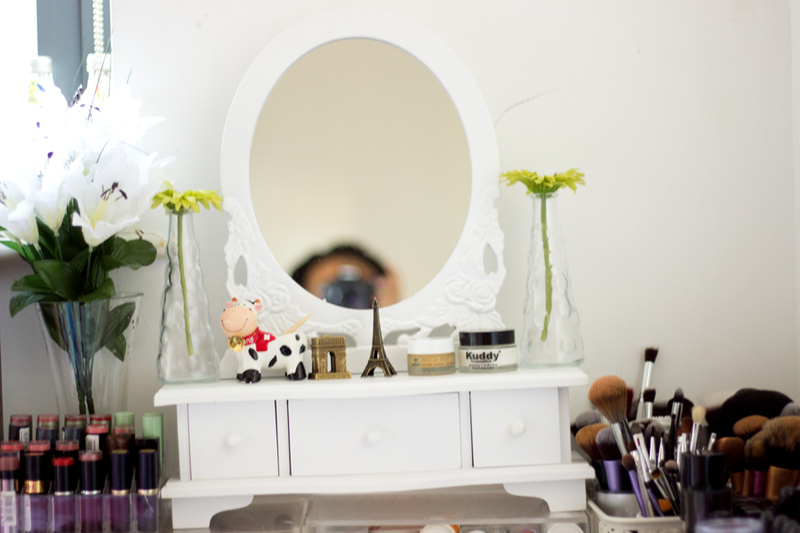 I have shown my Makeup table/desk (here), my Makeup collection (here), my Muji storage (here), Makeup brush collection (here) and now there is a new addition to the gang- My New Vanity Mirror. 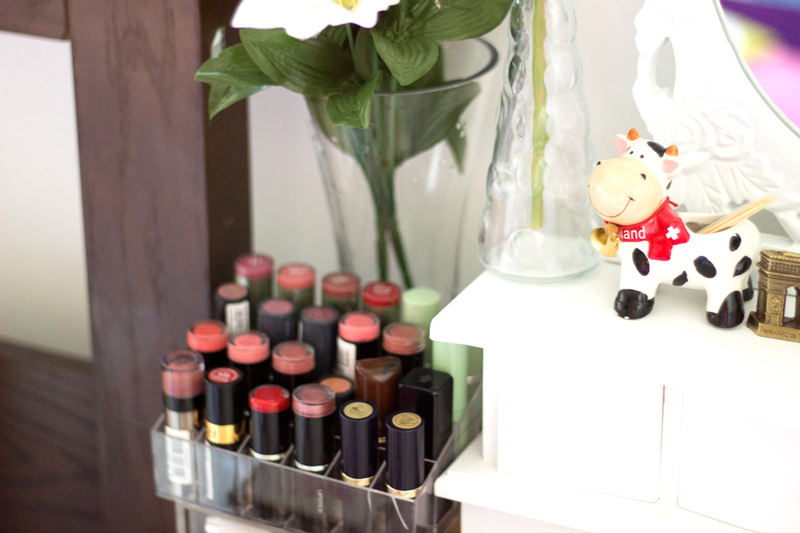 My whole beauty "area" is quite small so I try to utilize all the space I have as effectively as I can. 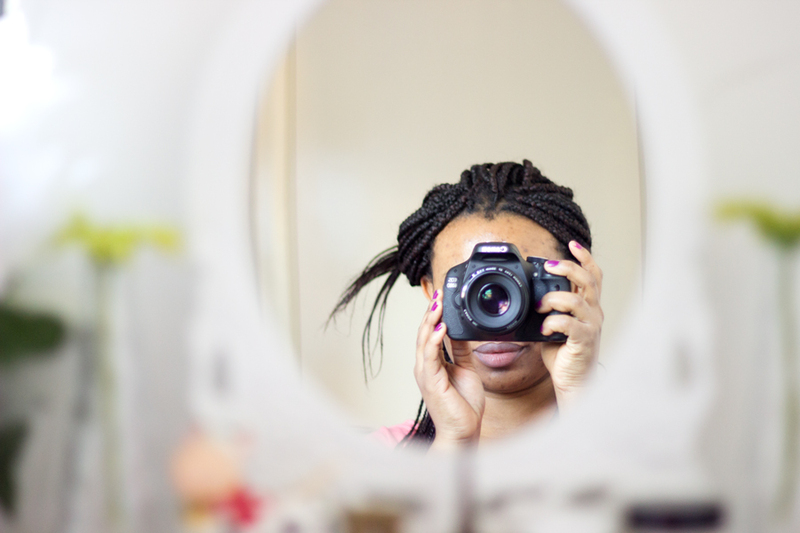 I bought this mirror back in October and it was a total bargain. I popped into Centre Court Wimbledon one bright and sunny Sunday after church and I usually love to window shop on Sundays. I was browsing through this shop on the first floor called Beautiful House Furniture and believe me, their furniture and other household items are just dreamy. They are so beautiful and if you love Pinterest, you would love this store. As much as I love pretty furniture, I am a bit hesitant about buying them just yet because I am still renting so I can't really go crazy furniture shopping until I have my own house. Anyway, I saw this on sale for £24.95 and I was so shocked because it was originally £60. I quickly snagged it (it was the only one left) because it is the perfect size for my room and fits really well with my IKEA Table. It also adds some character to my room because it has a vintagey feel to it and brightens the overall atmosphere. 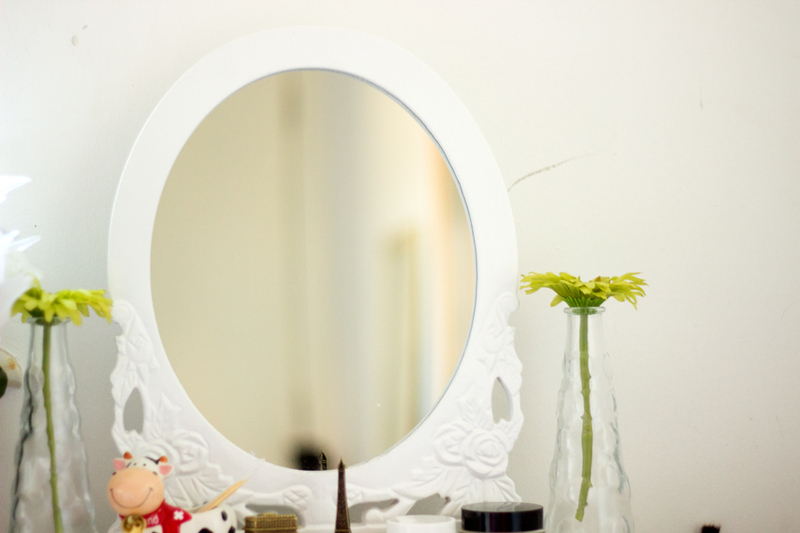 This vanity storage comes with a mirror as you can see from the pictures and the mirror is not adjustable which is not too much of a problem but if you like to swivel your mirror then this may not be the one for you. It is painted white with a pure wood finish and it is not laminated or vinyl coated (or is lacquer? You know what I mean). One good thing about it is how easy it is to clean; I just use a damp cloth or furniture wipe and swipe across the surface and it looks clean. It has three drawers which is really cute and they come all the way out so you can clean them properly. They are not very deep so you can't store too may things inside. One of the drawers is quite big compared to the others (it's in the middle) and the two at the side are a little bit smaller. I have not really decided what I should put into these drawers yet but I popped in some beauty and makeup samples I need to try in the bigger drawer and Q-tips and Lancome sample lipsticks in the other two. 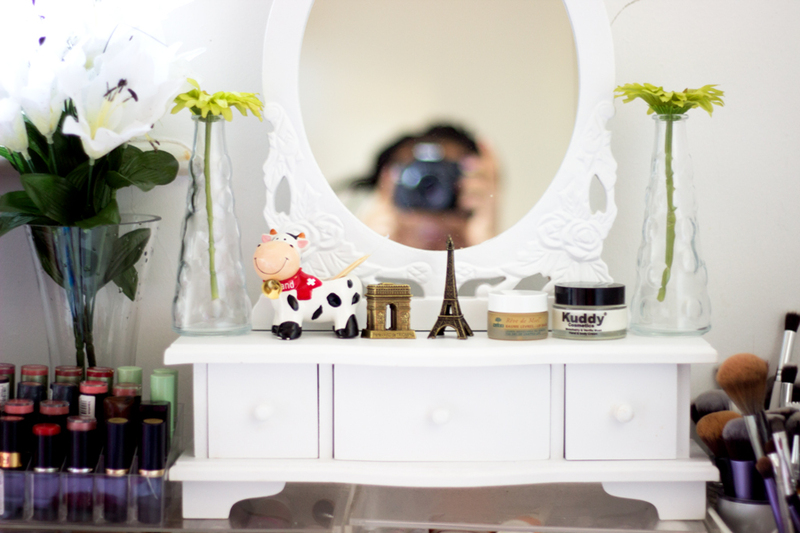 One of my favourite features of this vanity is the small shelf on it; well it's not really a shelf but I use it to store a few things. 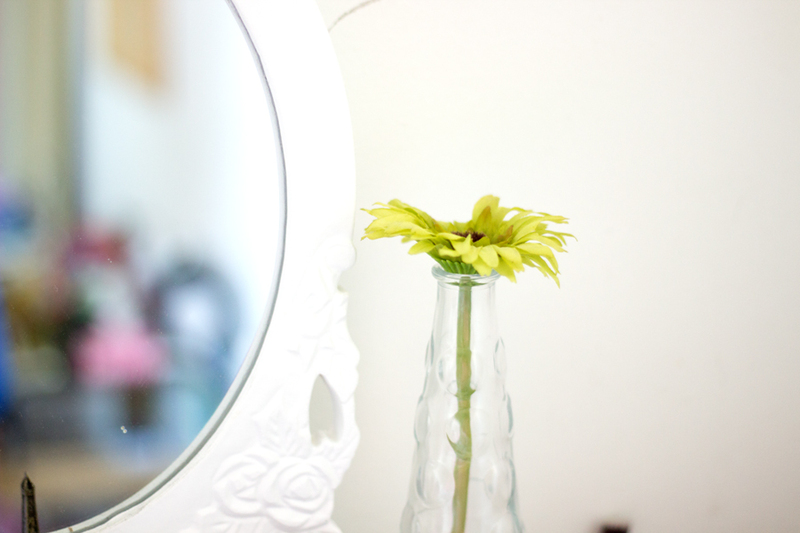 I have two small flower vases and faux flowers on each side of the vanity mirror which you may have seen on this blog many times. 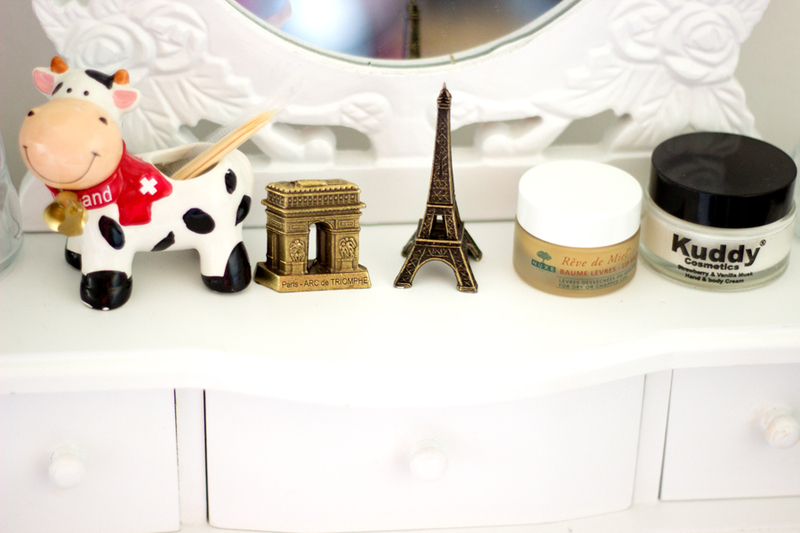 On top of this shelf, I have put my little souvenirs I bought from Paris (Tour de Eiffel and Arc de Triumph) and Switzerland (A cute smiling cow toothpick holder). They make me so happy and remind me of how lovely my holidays were. I also have my Kuddy Cosmetics Hand Cream and my Nuxe Reve de Miel Lip Balm because I use them every night before bed. That's it really! I hope you enjoyed this quick lil' post and I would catch up in my next. 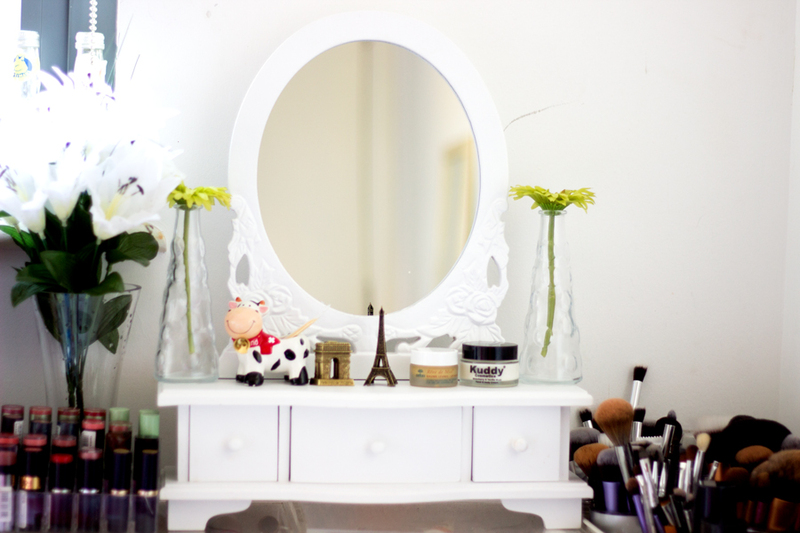 What are your favourite Pinterest vanity/dressing table inspirations?